It wasn’t long ago in the history of American cinema when high caliber boxing movies seemed to be a dime a dozen. Things have slowed down in recent decades and Hollywood just doesn’t seem to be as interested in retelling the tried and true story of Raging Bull or Rocky anymore. Aside from the occasional award winners like The Fighter, the genre has come to a quiet halt over the last ten years. Southpaw is Sons of Anarchy creator Kurt Sutter and acclaimed Training Day director Antoine Fuqua‘s attempt to bring a new light to the same old song and dance we’ve seen before. Does this look at fighter’s redemption story pack a real punch or is it better leaving its gloves hanging in the locker room? Southpaw is the story of undefeated boxer Billy Hope(Jake Gyllenhaal) and his fall from fame after the tragic death of his wife Maureen(Rachel McAdams). Hope’s whole life falls apart as he slides into depression and begins neglecting his daughter Leila(Oona Laurence). After hitting rock bottom Billy decides to turn his life back around by training with a reluctant Tick Wills(Forest Whitaker) to get back into the game as the world’s best fighter in order to bring his life and family back together again. The premise and story arc on the table is something we’ve all seen before. A world class athlete loses the thing closest to him and his whole life crumbles as he slides into alcoholism and only the love and discipline of his sport can bring him back. Southpaw attempts to separate itself from the rest of the pack by focusing on dark pitfalls the athlete must overcome in order to be redeemed. Unlike most stories of this nature that spend more time on the rise and fall of the hero, this one spends an extensive amount of time exploring the life of the tumultuous doldrums. It’s an interesting approach, but it inevitably leads you to hate the main character for repeatedly making bogus decisions. It’s not the way the character is written or the way Gyllenhaal decides to portray his character that makes this frustrating, it’s all in the way this character is is framed in the context of his own story. Billy’s redeeming characteristics are very limited and once he loses everything he continues to self destruct beyond the point of interest. It’s doubly frustrating because the story still plays by all of the rules of the genre which robs the film of any real doubt or suspense as to how this “beaten beyond annoyance” character will bounce back. Jake Gyllenhaal had an uphill battle to sell his especially unlikable character and to some degree he succeeds. Everything from his stride to new body build screams a dedicated and well intentioned performance. He’s swinging for the fences and unfortunately the character he’s tasked to bring to life just isn’t as interesting or likable as Kurt Sutter wants you to think. The rest of the supporting cast more or less show up to play the scenes and get their paycheck. Amy Adams brought a bit of flare to her character, but is down for the count in less than twenty minutes. Forrest Whitaker continues to run with his washed up mentor routine and Miguel Gomez plays the same thug type we’ve seen from him on The Strain. 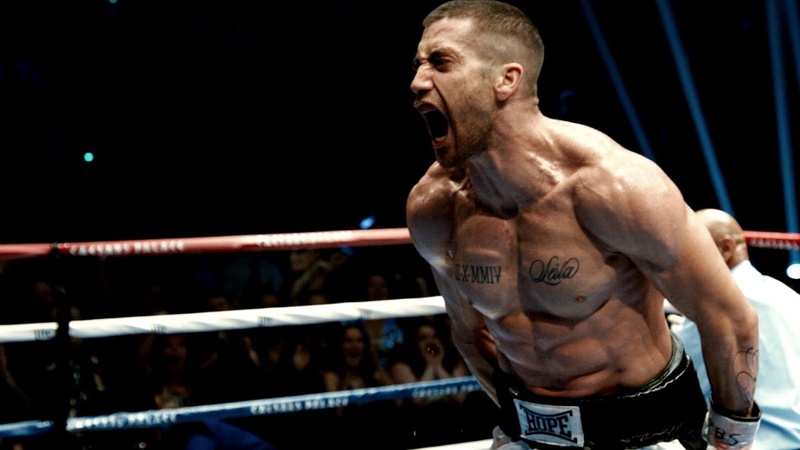 Southpaw‘s saving grace is its impressively filmed and choreographed boxing matches. Antoine Fuqua continues to shine as an action director with each and every match becoming more brutal and sophisticated than the last. His use of the first person camera and close up on his opponents faces create a visceral experience putting you right the ring with Hope for each and every blow. It’s in these moments that Billy Hope comes to life and all off the needlessly bleak character drama is forgotten. If Southpaw is ever remembered for anything, it’ll be its ability to bring the contemporary HBO-esque boxing match to the big screen in a relevant manner. This film deserves a notable amount of credit for working hard to be something special. Kurt Sutter’s script feels very invested in exploring the demons, Gyllenhaal is knee deep in one of his most dedicated performances yet, and Fuqua is determined to create a powerful visceral experience. The problem is this movie ultimately spends more time playing into classic boxing tropes and less time subverting them which leads to a predictable movie without much new to say. All three of these players undeniably deserve and “A” for effort and all of them have some pretty decent material to add to their portfolios, but the final product just doesn’t deliver anything compelling enough to justify this movie’s existence. Southpaw is another great reminder to up and coming filmmakers who are interested in exploring pre-existing stories. Always make sure to have something new and meaningful to bring to the story. Having an admirable artistic style alongside top notch talent means nothing when it’s got nothing new to bring to the conversation. Fans of Boxing or fights will definitely want to catch this at a matinee, but for audiences looking for something they haven’t seen before, this the thing movie rental nights are made of.